Conservative Anglicans love to crow about numbers (unless the numbers work against their narrative). We Episcopalians are told that we must be wrong, because the vast majority of the Anglican Communion have different views. The majority must be right, surely? Folks on the right — who claim to love the “plain meaning” of scripture — must know that Jesus does not call for a numbers game (see the Mad Priest’s illustration). According to the scriptural view, in fact, the majority is probably wrong! Only a few people choose the narrow path. Does this mean that the Episcopal Church is clearly correct, precisely because it has rejected the preference of most of the archbishops of the Anglican Communion? Well, no, of course not. This isn’t about numbers. Oh, one more thing. Just in case you haven’t been reading 7WD for long, I want to repeat a key point. Archbishops do not speak for all bishops, and bishops certainly do not speak for all lay people in their dioceses. In my experience, visiting a large number of provinces across the Anglican Communion, most Anglicans are unwilling to elevate disagreements over sexuality to primary importance. It’s only some bishops who make lots of noise on the subject. When Mary Glasspool was consecrated, that quiet sound you heard was Anglicans throughout the world cheering for another victory of love over fear. The quieter sound was the gnashing of teeth. Didn’t hear it? It was a much softer sound. Why cheer yet more rupturing of a nearly-broken Communion? I would have thought that was something to weep over, not celebrate, even if you are in the right. By all means, reform the church; it needs it. But do it with fear and trembling, because it’s a fragile thing. Simon, my intention was not to cheer rupturing in the Communion. If you have a look at other posts I’ve written here, you’ll notice a consistent theme of sadness and dismay at the increasing divisions among Anglicans. But you’ll also notice that I’m quick to reexamine the narrative that sometimes comes from the right. 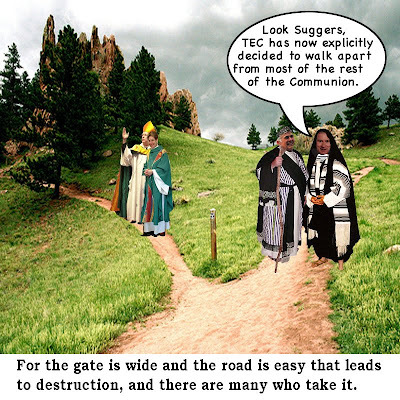 If the Communion if permanently torn apart, it will be because some bishops (ironically) made that choice. Progressives should surely move ahead, if called to do so, with an awareness of the pain that their actions cause. But conservatives should also, if they are called, resist change with an awareness that there’s a real possibility that the church may itself be called to adapt its application of the faith, just as it has done for 2,000 year. There’s a time for sadness, to be sure. There’s also a time to be joyful and to recognize joy. My real point in writing about “cheering” was to say that many Anglicans around the world did just that last Saturday, despite what we sometimes hear — claims that every Anglican in some provinces is distraught about the American church. The church is indeed fragile. Lord, have mercy upon us. It amazes me that the CoE goes on about our ‘choise’ of not walking together along the same path. Have we ever said we wouldn’t ‘walk in Love, as Christ loved us’? Have we ever cordially disinvited them to a large gathering where faith and love meet?? We can hold difference of opinion and stil walk in a unified, positive direction. We don’t like what some branches of the communion have done. Yet we never said we wouldn’t walk together. It would be more to the point to state that the ‘greater Anglican communion’ (our Canadian sisters and brothers at our side) have decided to walk away from us. Makes the ‘See how these Christians love one another’ quote all the more poignant. The point that I thoroughly miss in all this kerfuffle is: okay, let us assume for a moment that homosexuality is wrong. In what way does this disqualify the possibility of homosexual priests or bishops? Am I to believe that priests, as a category, do not each live in some deliberate kind of unrepentant sin? Am I to believe that in every culture on earth, there are not activities equally abhorrent to God, which are not only unrejected but celebrated? Am I to believe that on the matter of homosexuality alone, the validity of a sacrament is determined by the virtue of the presider? Am I to believe that for the sin of homosexuality alone, sinners still in transformation cannot also be called to serve as sacramental leaders? If a given “conservative” can answer “yes” to all of these questions, I will grant them that perhaps homosexuals should not be allowed into the priesthood. That’s a tall order, though. I wish we could tease apart the questions of “is homosexuality a sin” and “can homosexuals be church leaders” a bit more. I’ll grant that by and large, one wants priests to have some moral fiber, and to be examples of broadly good behavior, but it seems as though the conversation on homosexuality in the priesthood has gotten a lot more ritual-purity than that, and there’s no theological basis for it in the calculus of infinity. Next story The voiceless shape our future?